There are 4 different weather websites that I frequent to obtain the most accurate prediction of the skies before heading out on a journey. Not that one has proven to be more accurate than the others, but somehow I seem to favor the one showing signs of clearer skies. As if 3 of the 4 predictions are wrong and there really is a glimpse of sunlight to be had for Colossal 2016. It’s something I can irrationally average in my head to make it seem like it’s going to be better than I know it is. The mind is funny that way, always trying to outsmart itself and I’m just along for the ride. Regardless, the forecast wasn’t looking too(very) dry and I was worried that Colossal 2016 would be an epic, wet, soggy bust. All mental averaging aside, this year’s destination resided in the West Kootenay region of British Columbia around some of the most remote mining territory of(from the) late 18th Century. A region quite familiar to me having grown up in the stunning Kootenay valley of Nelson, BC. It’s an area I often encourage my Alberta counterparts to explore on their own time, knowing what a gem it truly is – the natural beauty, the culture, and the peacefulness. 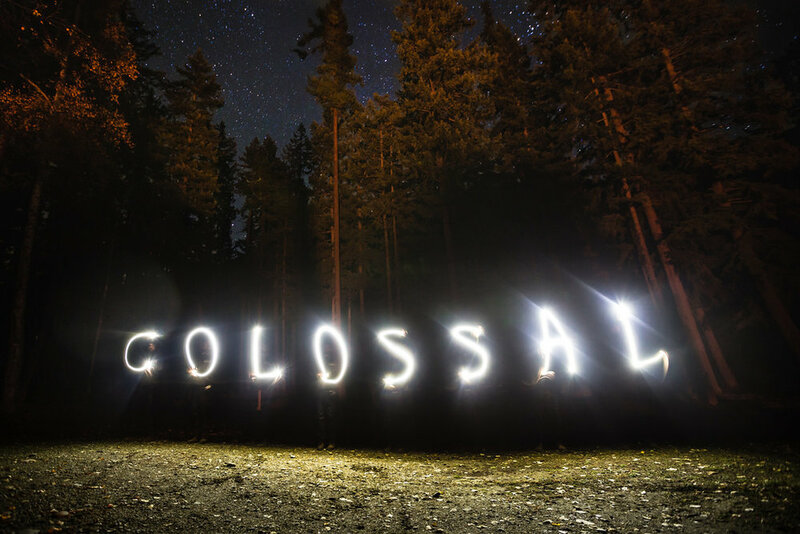 Colossal has been happening for 6 years now, although officially dubbed last year, and it felt right to bring it home. It’s the last camping trip of the year. The last weekend to fold out the RTT’s and sleep in the fresh air. The last glimpse of fall before we are forced into hibernation (or ski season!) for the year. But, most of all, I think of it as the last escape – leaving work stress and deadlines behind it’s an excuse to get as deep into the backcountry as possible, disconnecting from our modern world using our trusty Toy’s. Departure day had arrived. This year would be slightly different – full travel disclosure and locations would not be granted prior to departure. Not sure why I chose to do this and realistically it’s something I still would like feedback on. I guess in my eyes; I see the unknown as the necessity of adventure. Not actually knowing where we would be travelling to in the weeks of anticipation prior to this day seemed like a novelty I was willing to enforce. Emails, phone calls, face-to-face meetings, and text messages had been exchanged for weeks pertaining to vehicle preparation but no details were given on the primary location. Included(mandatory) vehicle and camping requirements had us all bustling to prepare our trucks in time for the trip. (Ask me how much sleep Jeff and I got the night before departure…) Wipers on full, I headed for the rendezvous point just outside of Calgary to gather with the group. Greetings exchanged and the clock ticking we hit HWY 1 Westbound for Revelstoke, BC. The drive flew buy as chatter on the radio kept boredom at bay and the od(d) hooning stint kept us alert. 10pm passes the Rogers Pass avalanche tunnels with 14 Toyotas sure brings a sense of calm, or was it abruptly loud RPM bouncing acoustics? One of the two. 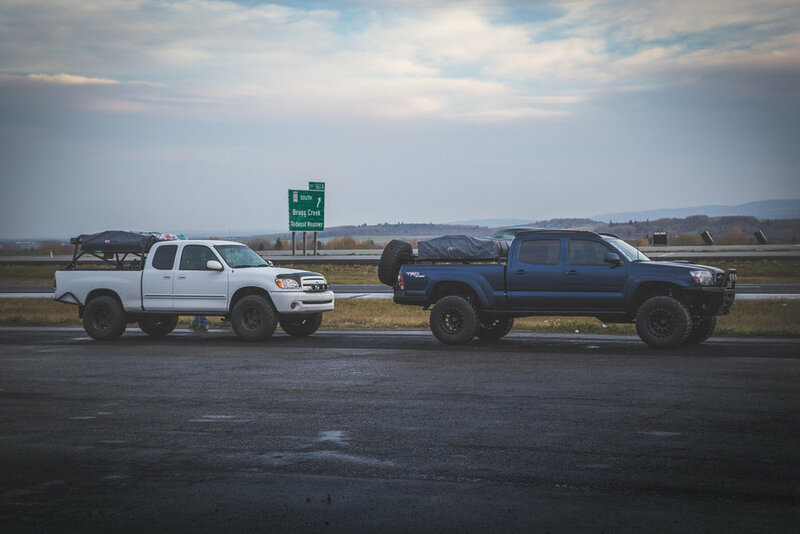 A pit-stop in Revy for fuel and a few choice words with(from) an enthusiastic member of the local Tinder population and we were bound for camp. We rolled in late with the rain still trickling over our windshields. It looked like my optimistic forecasting method wasn’t working out so well. Regardless, the group was all smiles as we rolled into our large campsite around 11:30pm. Nothing but turning birch trees, the scent of wet pine, and a backdrop of darkness to set our eyes on. Camp quickly deployed and out came the awnings and beverages to help keep us dry/warm. We had an early start to get to our final destination within a reasonable hour the next day, but without a warm dry bed this night, we figured a night-cap was the least we could do. Waking up the next morning was easy – simply rely on your fellow travel companions to alert you of sunrise via the gentle and rhythmic panging of camp cookware as they prepare a breakfast feast for sunrise. All sarcasm aside, the view from our campsite made an early morning justifiable. What was a blanket of darkness the night before appeared to be an epic view of Upper Arrow lake from our campsite. A pebble beach and large moss covered rock bluffs sank into the clear waters of the lake. Low lying clouds wrapped our company as we took in the mysterious views and prepared for departure. We shook the water off our tents as best we could, folded up camp, and raced towards Galena Bay to catch the 9am ferry crossing. Cutting it close for time we made forward progress at speeds suited for smooth pavement; not bumpy, rutted, narrow, gravel logging access roads! Our group eagerly drove up to the ferry gate as the first cars in line were already boarding. Arriving a moment later and we would have (been a moment too late)missed the ferry! Our group made form and rolled onto the D.E.V Galena as onlookers pointed at the posse of modified Toyotas. The stern deck raised and we started our journey east across Upper Arrow Lake. The calm waters and peaceful 20min ferry ride allowed us all to stretch our legs and finish our morning coffee. As we sailed East, the sun’s rays began to burn off the blanket of cloud, illuminating the basin with dramatic visuals. Anticipation was growing in the group, as they still did not know where we were going. Soon I would reveal the area of interest, but first I pulled out the map and reviewed our route once on the opposite shore, towards one of the area’s great mining boom towns of the late 1800’s. The ferry bumped the dock on the opposite shore as the convoy of Toyota’s turned over. The journey quickly turned North once off the ferry onto the desolate highway. Not a single car in either direction as we made the 30 min journey along the mountain’s base to the silver boomtown. Asphalt quickly turned to gravel, leaving us some good tack for more hooning with the still-damp road winding in front of us. It was if God himself had preserved this road specifically for our travel – the smoothest, non-rutted, assortment of earth particulates that I have yet to travel. After enjoying a combination of scenery and pure driving pleasure, we pulled over for a brief driver’s meeting before dropping into the small village. Relics of the long past mining era were visible in all directions: small log huts from the turn of the century and rusted mechanical equipment resided in the awkward mix of more modern amenities. The old western-style hotel looked like it belonged on a movie set for Hollywood’s next great western. Raised home foundations, tin roofs, and the scent of wood burning stoves made the remote location and (an inevitably) abundant winter snowfall evident. The jewel of the town though was the functioning gravity-fed glass gas pump. Our crew rolled up to the pump as the owner looked in surprise down the line of heavily modified Toyotas. I believe he may have met his monthly fuel quota after topping up all of the thirsty rigs. We took turns watching the owner hand pump the fuel from the main tank and up into the glass holding cylinder, before gravity feeding back down to the truck. Now topped up with fuel, we hit the road and headed up to the proposed trail location. The road was supposed to wind high up into one of the neighboring mountain ranges, giving us some exceptional views of the surrounding granite peaks. This area is known for not only it’s rich mineral resources, but also its massive granite spires. Unfortunately, the area is known particularly for its ATV trails, not necessarily 4x4 trails. Something that would pose as a challenge for the entire trip ahead. The optimism we felt with the sun shining on us during our earlier ferry ride began to fade. Rain clouds had embraced the landscape and it was now raining heavily as we navigated up the road. Many branches of trail headed off in all directions. Even though I had a map in front of me, I had the group led into several dead ends before stumbling on to what looked like a promising lead. It was a fairly tight and rocky trail that appeared to lead up in the direction of our final destination. About 5 minutes after entering the track, I pulled around a corner and was confronted by a Ford F350 with a camper over the box. A man stood outside of the cab, looking into the interior. It was pouring rain and as we approached, the man’s line of sight did not falter. I looked at my co-pilot with a “WTF” look on my face. After about 10 seconds of us sitting there awkwardly in the truck, the man turned and saw us, looking startled. I rolled my window down and said hello with a smile to help initiate friendly conversation and break the ice. I asked if he’d been up the trail before and he responded “Ya…..” Again, more awkwardness. I then asked, “Is this the [xxxxx] trail?” The man answered “No….” before starting to walk towards the cab of my truck. He obviously wasn’t too keen on sharing any information with us which made the situation feel rather uncomfortable as he approached. With no filter, the man came right up to the truck and asked what we were doing up here. A little on the defensive, I responded politely (like a Canadian would) hoping to ease the situation but almost ready to make an evasive maneuver if it became necessary. Somewhere in the awkward dialogue that came next he glanced back and saw the line of Toyotas behind #Doug. He instantly came around and smiled, asking “Are you guys a Toyota club?!? !” “Sort of” I said “we are just up here doing some 4x4 exploration in the area and looking for a specific trail.” He was suddenly relieved and excited all at the same time. “I have a gold claim up here” he said “I thought you guys were trying to poach my claim.” My co-pilot and I laughed to ease the tension and we chatted shop with him for a few moments before he turned us around to what he thought was the trail we were after. He asked if he could grab a photo of the group as we left and we obliged. We started to scale the trail in the new direction. As I looked out the window the man was flying down the bumpy logging road that we had just departed, his camper barely hanging onto the truck. He stopped and ran up the bank, nearly slipping several times, to reach a bluff where he pulled out (the very first cell phone with a built in camera) his 1990’s cell phone and began snapping photos of our posse. No harm done, but I still wonder what he was up to and am not really confident in the legitimacy of his story. I can honestly say I’ve never met a man who was able to use the F-bomb with such enthusiasm. Maybe he was afraid of us stumbling onto something he didn’t want us to find? Like Canada’s largest maple syrup conglomerate or the super-secret Canadian bacon factory, or our Prime Minister taking selfies? I’ll let you decide. We carried on for a while, again finding out we were on the wrong trail. Getting slightly frustrated as it was well past noon, we put some of the puzzle pieces together and started to make progress again on a new track. The trail was progressively tight and overgrown. It became an exercise of self-control as to not let the sounds of branches clawing at the paint bother us. Having a white truck, it’s not so bad, but I truly felt sorry for some of the members with darker colored paint, and newer rigs. Everyone took it well though, hoping that a good power polish would take care of the mangled clearcoat. The trail continued to rise in elevation but we were eventually pinched off – again reminding me that this area was known for ATV trails not 4x4. Luckily, we were stopped in an area that was easy for us to turn around and the low lying opening we sat in showed spectacular views of the surrounding mountain peaks. Larch trees provided beautiful orange contrast to the familiar green pines. The rock peaks had been lightly dusted with snow, providing even more contrast to the scene. It was truly beautiful and made it easy for us to justify a flight with the drone while we ate a late lunch. We captured some unbelievable footage while flying our drone, “Goose”. A small mishap led to a 3rd Gen T4R with a smashed rear window and a dented tailgate and somewhere in the mix another 4Runner with a flat tire. The day was truly becoming a test of our patience and perseverance. With full stomachs we thought it best to make for camp and attempt a good fire to turn our spirits. The descent was uneventful; everyone just wanted to get back through the gauntlet of branches as quickly as possible. The rain had subsided but the clouds still congested us so we just pushed hard for camp. Once back into town, we had a half hour jog along the lake’s edge. More high speed gravel and we hit the primary destination for the night. The crew crossed the short wooden bridge before spotting our campsite: a large clearing both on the shore of the lake and tributary. The rain was now coming down hard and camp was deployed in record time. The campsite was great other than the lack of thick coniferous to keep us sheltered. Fortunately for us though, there was one old growth cedar which had a firm grasp on one corner of the campsite. It must have been 4’ across at the trunk. Its branches dominated the airspace and also provided us with a 15’ canopy of shelter that kept the rain almost at bay. A large fire was ignited under the natural shelter. Laughter, craft beer, and the flame’s warmth began to bring us all back from the dead. One by one we retired as the long day took it’s hold and we climbed to our elevated shelters. The weather was out of my control, and I had accepted that… but it’s still hard not to feel responsible for what, in my opinion, were shortcomings of the journey so far. Weeks of planning, coordination, and genuine commitment from all the attendees; there is always a slight amount of pressure to deliver on the promise of epic views and adventure. Despite the group being some of the (most) positive and happy individuals I could ask for, I still lay in bed praying for clearer skies and wider trails.